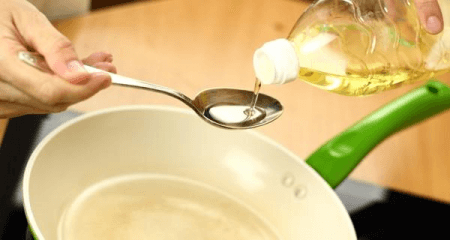 Unless you have vowed to completely avoid using cooking oil in your food, you surely have seen the various types of oil sold in supermarkets and grocery stores. The most common and affordable ones are vegetable oil and corn oil. What is the difference between the two? This article will discuss their differences. Corn oil or “maize oil” is a type of oil that is extracted from corn kernels. It is dark yellow and has a mild, roasted taste. It has a high level of saturated fats and a low amount of good fat, which is why many people consider it to be an unhealthy type of oil. To produce corn oil, most manufacturers extract the oil from corn kernels using a chemical (i.e. a solvent) and then refine it by alkali treatment. The last step involves distillation to remove the wax and odor from the oil. This process is more cost-effective and speedy than mechanical extraction. Corn oil is best for pan-frying because of its high smoke point (450°F ) and baking (e.g. cornbread, fudge cake, moist cake) but is not a good option for drizzling and low heat cooking. It is also used as the chief ingredient in making margarine. In addition to its culinary uses, corn oil is used to produce soap, paint, inks, insecticides, and biodiesel, among others. In general, corn oil is relatively inexpensive in comparison to most types of oil. In the United States, it is the most common and most affordable type of cooking oil because of the abundance of corn. On the other hand, vegetable oil is a combination of any plant-based oil, which typically includes sunflower, soybean, corn, and safflower oil. It is produced by extracting the oil from the seeds of the plants either by using the traditional oil mill or by using a chemical such as a solvent. The oil then undergoes purification. Vegetable oil is basically all-purpose. It is best for frying (both pan-frying and deep-frying) because of its high smoke point (428°F on average). It can be also used as a shortening in baked products and as an ingredient in salad dressings and margarine because of its neutral flavor. It is important to note, however, that vegetable oil is not recommended for drizzling because it lacks flavor. Moreover, vegetable oil is used to produce candles, paint, detergents, shoe shiner, coatings, and corrosion inhibitors. The level of saturated fat, polyunsaturated fat, and monounsaturated fat in vegetable oil depends upon the specific types of oil included in the blend. For this same reason, it can also be difficult to control the types of fat you are consuming when you cook with vegetable oil. Vegetable oil is very affordable and common around the world because of the abundance of its raw materials. What, then, is the difference between corn oil and vegetable oil? The greatest difference between the two is how they are produced. Corn oil is produced by extracting the oil from corn kernels, whereas vegetable oil is made by extracting the oil from the seeds of different plants (typically sunflower, safflower, corn, and soybean). Corn oil has a mild, roasted taste, whereas vegetable oil has a neutral taste. Corn oil can be used for baking and in making margarine, while vegetable oil is “all-purpose” and can be used for baking, making salad dressing, and cooking. Corn oil is believed to have a high level of saturated fats and a low amount of good fat. On the other hand, the level of fats in vegetable oil varies depending on the types of oil included in the blend.